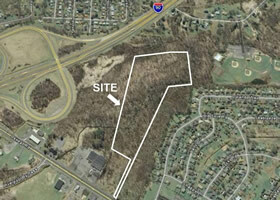 19.8 acres ready for residential development, or for a zone change to commercial. Residential piece is 19.8 acres. Currently zoned R-1 and would be great for residential development. Mostly wooded site, generally level. Also a great candidate for re-zoning.